You will promote and nurture Artists; buy, display, and sell their Art; and build and exert your international Influence. As a result, you will achieve the respect needed to draw visitors to your Gallery from all over the world. There's a lot of work to be done, but don't worry, you can hire assistants to help you. There's a long queue of unemployed Art aficionados lined up, hoping to work with someone of your stature. Build your fortune by running the most lucrative Gallery ever. Place the Game board in the middle of the table. Place the Player boards around the Game board nearest to the Gallery of the appropriate color. Place Visitors in the cloth bag: For 4-Players, use all Visitors. For 3-Players, remove 2 of each type and place them in the box. For 2-Players and Solitaire games, remove 4 of each type. 1 Place each Player's Influence marker (disc) on the "10" space of the Influence Track. 2 In the box office, place a number of tickets of each color depending on the number of Players. 20 tickets for a 4-Player game, 15 for 3-Players, and 10 for 2-Players and Solitaire Games. Place any remaining tickets back in the game box. 3 Shuffle the contract cards, and place them face-down on the leftmost space. Draw the top 4 cards and place them face-up on the four contract display spaces. 4 Shuffle all 16 Artist tiles and place them one at a time onto the spaces on the board which match the color and Art form of the Artist. If you draw an Artist whose space is already occupied, return it to the game box. Repeat the process until all spaces are filled and then return any remaining Artists to the game box. There must be one blue and one red Artist for each Art form. Place the first drawn blue Artist tile face-up, and mark its initial Fame with a white cube. Initial Fame value is printed on both sides of the tile. 5 All other Artists begin the game face-down. Shuffle the Artist bonus tiles and place one at random on each Artist. Return any remaining Artist bonus tiles back to the box. Place one white Visitor (Collector) from the bag on each red Artist tile. 6 Place both of the Artist's Signature tokens next to all the corresponding Artist tiles. 7 For each Art form, shuffle the respective Works of Art, and place each stack face-up on the space next to the appropriate studio. Take the top tile from each of the stacks and set them aside for now. 8 Place a number of random Visitors from the bag on each topmost Work of Art equal to the number of tickets depicted on the tile. 9 Stack each of the Promotion tokens on the corresponding numbered spaces. 10 Randomly choose 12 Reputation tiles and place one face up on each space of the upper 4 rows of the international Market. In the Solitaire or 2-Player games, choose only 8 tiles and only cover the upper 4 rows of the 1st and the 3rd columns. 11 Shuffle the 4 Works of Art you previously set aside and place one at random on each of the easels beside the board. Use three easels for a 4-Player game, two easels for 3-Players and one easel in the 2-Player and Solitaire game. These are Works of International renown. Put any remaining easels back in the box along with the remaining Work(s) of Art. 12 Place 4 random Visitors from the bag in the Plaza and 1 random Visitor in each Player's Lobby. 13 Randomly choose 4 of the remaining Reputation tiles and place one of them at random face-up next to each Location on the game board. 14 Choose a start Player at random and give him the Starting Player marker. In reverse Player order, each Player chooses one of the Locations, places his Gallerist there and takes the Reputation tile from that Location. Place remaining tiles back in the box. Place everything else near the game board. Place 8 Assistants on the spaces of the unemployment queue. Place the remaining 2 Assistants at desks in the office. Place the Reputation tile taken earlier on the 3rd Art space of his Player board. Take 10 money from the bank. Shuffle the Art Dealer cards and deal one at random to each Player. Do the same with the Curator cards. These cards are kept secret from other players. The game is played over a series of rounds, beginning with the Start Player. 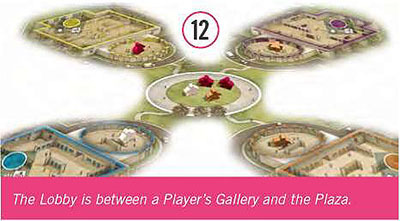 On a Player's turn, they move their Gallerist to one of the four Locations on the game board, and perform one of the two actions at that Location. Additionally, a Player may also take one of two 'Executive Actions' on their turn, either before or after performing their Location action. If a Player moves his Gallerist to a Location where another Player is present, that Player is Kicked-Out and will get to perform a special 'Kicked-Out Action' after the current Player has finished their turn. Because of the 'Kicked-Out Action', Players may take extra moves outside of their normal turn. Remember that the next Player to take their turn is always the Player to the left of the Player who performed the last Location action. This dynamic element of the game really sets it apart, and keeps everyone thinking. On a Player's turn, if t he Player is at a Location (has not been Kicked-Out), they MUST MOVE their Gallerist pawn to a different Location. 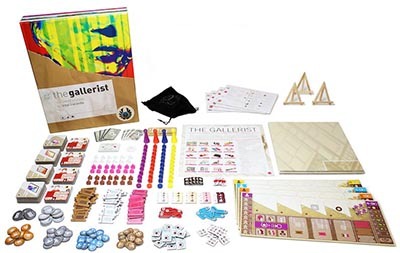 Additionally, if a Player moves from one Location to another, he may leave behind one of his Assistants on the space the Gallerist pawn is moving from. This Assistant may come from either an office desk, or another Location. 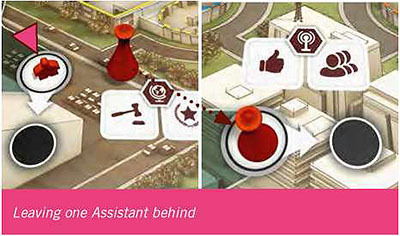 By leaving an Assistant behind, the Player will gain a Kicked-Out action if their Assistant is displaced. Once at the new Location, the Player MUST select one of the two Location actions possible. Example: Orange is taking his turn. His Gallerist is currently at the International Market. He chooses to move to the Media Center. He decides to leave an Assistant behind at the International Market, so he picks up one Assistant from his office and places it on the International Market Location. If he had an Assistant in another Location, he could have moved that one instead. Finally, he performs one of the two possible actions at the Media Center. On a Player's turn, in addition to taking a Location Action, he may also take an Executive Action. If he does so, this action is performed either before or after the Location Action, at the choice of the Player. Moving Visitors by offering tickets. Using a bonus from a contract card. A Player may discard any number of tickets. Each ticket discarded allows the Player to move one Visitor of the same color one space on the board TOWARDS his own Gallery. A single Visitor may be moved more than once as part of the same action. Discarded tickets are placed on a discard pile to the side of the game board (not returned to the box office). A Visitor at the Plaza or in any Lobby may be moved by any Player, but once a Visitor enters a Gallery, it cannot be moved out by discarding tickets. A Player is limited on the number of Collectors he can have in his Gallery at any one time. This is equal to 1 more than the number of Works of Art the Player has sold. Look for this symbol in each player's Gallery on the game board. Example: Move a Visitor from the Plaza to his Lobby (not vice versa), move from his Lobby to his Gallery (not vice versa), or even move from another Player's Lobby to the Plaza. During the game, Players may take contract cards, which are placed on their Player board. The bonus shown on the card can be used by the Player taking an Executive Action to place one of his Assistants (from either his office or a Location) onto the card. This bonus may only be taken once, and the Assistant used remains on the card to represent this. Example: Blue has a contract card on his Player board. He may use an Executive Action to place one of his Assistants onto the card to receive the bonus shown. (The image to the right shows the bonus of drawing a new contract card). 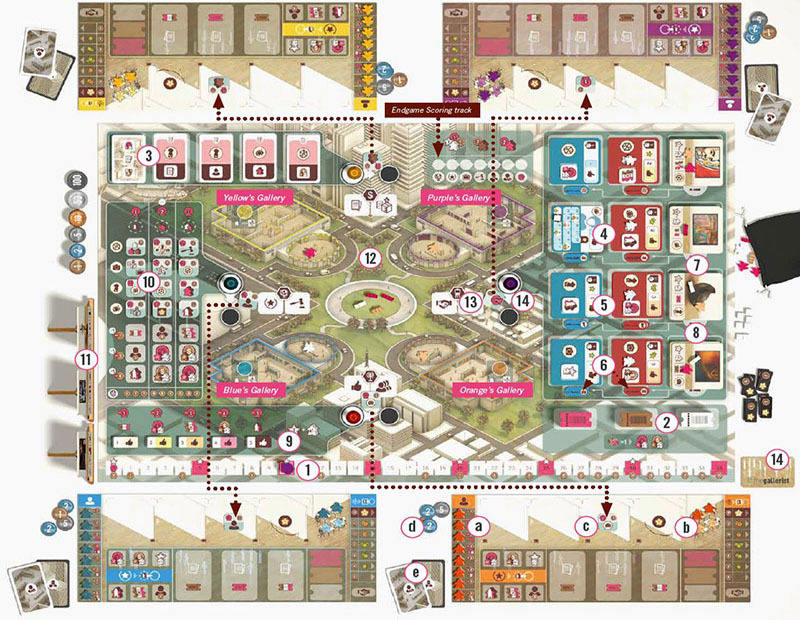 Later in the game, if the contract card is used to sell a Work of Art, the Assistant is returned to the Player's office and the contract card is flipped over, depicting a new bonus that may be taken by performing another Executive Action. See description of the bonuses on the Player aid. Example: Blue completes the contract card in the previous example and the Assistant returns to his office. He may then use an Executive Action later in the game to place one of his Assistants back onto the card, but this time receiving the top bonus on the back of the card. If a Player moves their Gallerist pawn to a Location where there is already another Gallerist pawn or Assistant, that piece is 'Kicked-Out' and moved to the black space in front of the Location space. After the active Player finishes their turn, the Player who was Kicked-Out may take a special 'Kicked-Out Action', and then the Gallerist pawn / Assistant returns home (see Going Home - bellow). It is possible for a Player to kick out his own Assistant. In this case, the Assistant returns home, but the Player does not get to perform a Kicked-Out Action. Reducing Influence back to the previous Fame icon to perform one of the Location's Actions. Take an Executive Action (see above). Taking a Kicked-Out Action is optional, but the Gallerist pawn or Assistant still goes home even if no action is performed. Whenever a Gallerist pawn is sent home after being Kicked-Out from a Location, it is returned back to his Gallery on the game board. Whenever an Assistant returns home, it is placed on an empty desk in the Player's office. If all four desks are occupied, the Assistant is removed from the game and returned to the box. Example: It is Purple's turn. She moves to the Sales Office, where the Yellow Player has an Assistant. Yellow's Assistant is moved to the black space in front of the Location space. 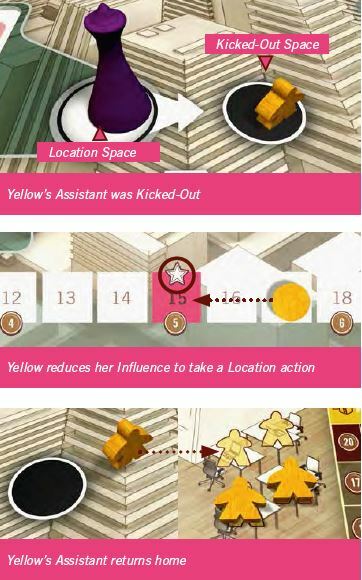 After Purple has performed her Location Action, Yellow may use her Kicked-Out Action to also perform the Location Action (moving her Influence marker back to the previous Fame icon). The Assistant returns home. Read here all detailed information about the locations: The Artists Colony, Sales Office, Media Center and the International Market. A Player takes a Location Action during a Kicked-Out Action. A Player takes the Promotion Action from Media Center. A Player performs an action which increases the Fame of an Artist. If the marker reaches the end of the Influence track, any additional Influence gained is lost. The first two situations have been covered already in the rules. The other two situations are explained here. When a Player needs to spend money he may move his Influence disc back on the Influence track to the previous space that shows the money icon. This gives the Player 1 money. He may continue moving his Influence disc back, gaining an additional 1 money for each money icon space moved to. Note that moving an Influence disc from space 35 to space 34 only generates 1 money. Example Blue has 13 Influence and wants to buy a Work of Art that will cost 5. He only has 3 money. He moves his Influence disc back to space 8 and gains the 2 money he needs. The number inside the money icon on the Influence track is only used for endgame scoring. 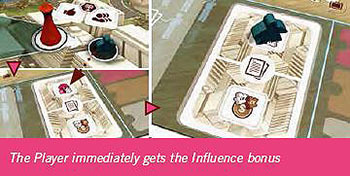 A Player may use the Influence track to gain all the money he needs at the time, even if he has money in hand. In the example, the Blue Player could have moved his Influence disc back to the start, gain an additional 2 money, spent the 5 he needed, and kept 2 of his original money in hand. It is not allowed to use the Influence track to gain money which is not then spent immediately. When a Player takes an action which increases the Fame of an Artist, he may move his Influence disc back on the track to the previous space with the Fame icon. This adds an additional 1 Fame to the Artist. He may continue to move his Influence disc back, granting an additional 1 Fame to the Artist for each Fame Icon space he moved to. Example: Orange has 12 Influence and buys a Work of Art. The Artist would gain 2 Fame from this action, but Orange chooses to move his Influence disc back to space 10 (the previous Fame icon), and the Artist gains 1 additional Fame. If he moved the disc to space 5, the artist would gain 2 additional Fame. Whenever a Player gains tickets, they are taken from the appropriate stack in the box office on the game board. The color of ticket taken must match the ticket icon on the board / component. 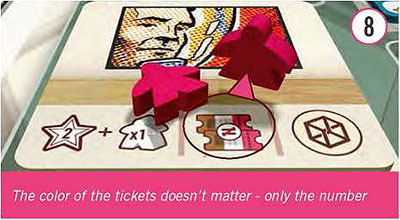 If the printed ticket has a triple-color, a Player may take a ticket of any color. 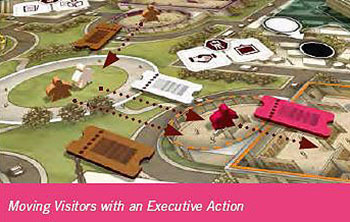 Tickets are used for moving Visitors as an Executive Action. Important Rule: You can never take 2 tickets of the same color at the same time. 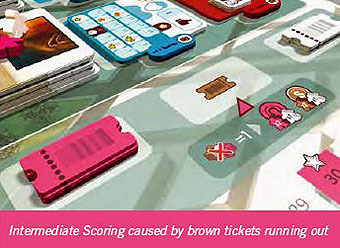 If a Player gains a ticket of a color and there are no more of that type of ticket in the box office, the Player instead removes one of any other type of ticket from the box office (if any), places it in the discard pile, and then takes one ticket of the correct color from the discard pile. Once the box office is empty of all tickets, Players take any tickets gained from the discard pile. Example: Purple buys a Work of Art that gives 2 tickets of any color. She wants one white ticket and one brown ticket, but there are only 2 brown tickets in the box office. So, she takes one brown ticket as normal, and then discards another brown ticket from the box office and takes a white ticket from the discard pile. At the end of the turn in which the last ticket of one color is taken from the box office, each Player earns Influence and money. Intermediate scoring only happens once during the game, when the first stack of tickets runs out. 2 Influence per VIP and 1 Influence per Collector in his Gallery. 2 money per Investor and 1 money per Collector in his Gallery. This happens immediately after the active Player finishes his turn and before the next Player starts their next turn. An Artist's Fame determines the sales value of their Works of Art. This is both the cost to buy them, and also the amount of money a Player receives for selling them. Therefore, it is a good idea to buy a Work of Art from an Artist when he is mostly unknown, and then sell it when he is more famous. There are two ways to increase an Artist's Fame. Promoting them in the industry via the media. When a Player buys a Work of Art, they track the Sales Value of it by placing the corresponding Signature token next to the Art value track of his Player board. 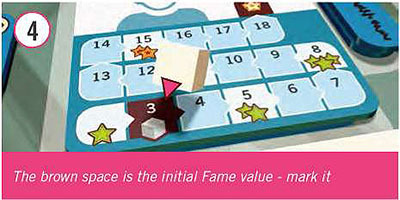 Whenever the Fame of an Artist increases to the next Fame symbol, any Works of Art increase in value, and Players adjust the Signature tokens accordingly. If an Artist's Fame reaches 19, the Artist becomes a Celebrity and retires. Place a Celebrity tile over the Artist and gain 5 money. Any exhibited Works of Art by the Artist who has just become a Celebrity becomes a Masterpiece. Players with at least one Masterpiece in their Gallery are allowed to use the 4th slot. This additional slot is only available as long as the Player still has a Masterpiece in his Gallery. No more Works of Art can be bought from the Artist except for a commission. Example: Blue buys a Work of Art from an Artist who currently has 16 Fame. Thankfully, because this was a commission, Blue only pays 10 (the original Fame of the Artist). After the purchase, the Fame of the Artist increases by 4 (2 because of the Work of Art, and another 2 because Blue has 2 Collectors in his Gallery). This pushes the Artist's Fame to 19 (the additional Fame is lost) and he becomes a Celebrity. Blue places a Celebrity tile on the Artist and earns 5 money. Since the Work of Art he just bought is now considered a Masterpiece, his Gallery may now contain 4 Works of Art, instead of 3. The box office is empty of tickets. Two or more Artists have become Celebrities. The bag is empty of Visitors. As soon as two or more of these conditions occur, the round continues until the last player finishes his turn. Then, beginning with the Starting Player, in turn order, each player gets one more turn as normal with the exception that if a Player is Kicked-Out, he simply sends his Gallerist home and does not perform a Kicked-Out action. Final scoring then takes place and the Player with the most money wins the game. Use the spots in the upper right of the game board to track the Endgame Scoring steps. Each column of the International Market is scored separately. The Player with the most Assistants in the first column (including those involved in the auction) receives 6 money. The Player with the second most Assistants receives 3 money, and the Player with the third most receives 1 money. In case of a tie, add all tied positions together and split the result between the Players (rounded down). A Player with no Assistants in a column receives no money. Repeat the process for the second and third columns, with the money awarded shown below the table. Each Player earns money and/or Influence for each Reputation tile they have on their Player board. For each Work of Art currently exhibited in a Player's Gallery, that Player receives money equal to its sales value. The Works of Art on the easels are auctioned off. Add up each Player's total offer based on the Assistants they have on the bottom 3 rows of the International Market. Each Assistant is worth 1, 3 or 6, depending on the row they are on. The Player with the highest total offer chooses one of the renowned Works of Art and places it either in his Gallery (even if there are no spaces), or next to his Player board (along with any previously sold works). If multiple Players are tied for the highest total offer, the Player with the higher offer in the 3rd column wins. If there are no offers in the 3rd column, look at the 2nd column, and so on. The Player with the second highest offer then takes one of the remaining Works of Art. This process repeats until all works have been taken. Each Player may only take one renowned work. When a Player takes a Renowned Work of Art (whether he puts it in his Gallery, or next to his Player board), he receives money equal to the sales value of that work, as if it was created by the most famous discovered Artist of the chosen Art form. 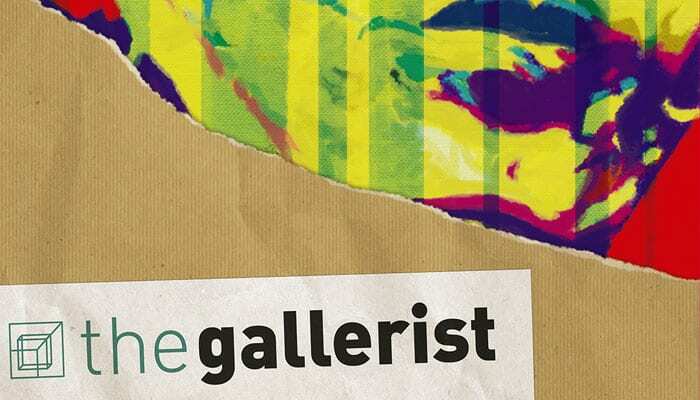 Each Player earns money for completed collections of Art (currently exhibited in their Gallery) as shown on their Curator card. A Player may have at most five exhibited Works of Art (including at least one Masterpiece and one Auctioned Work of Art). A single Work of Art may be part of two collections and can be used to fulfill more than one goal. Each Player earns money for completed sets of sold Works of Art as shown on their Art Dealer card. Each Player receives money based on their position on the Influence track. The Player with most Works of Art acquired (exhibited and sold). The Player with most Visitors in his Gallery. The Player with most Assistants in play. If there is still a tie, all tied Players win.